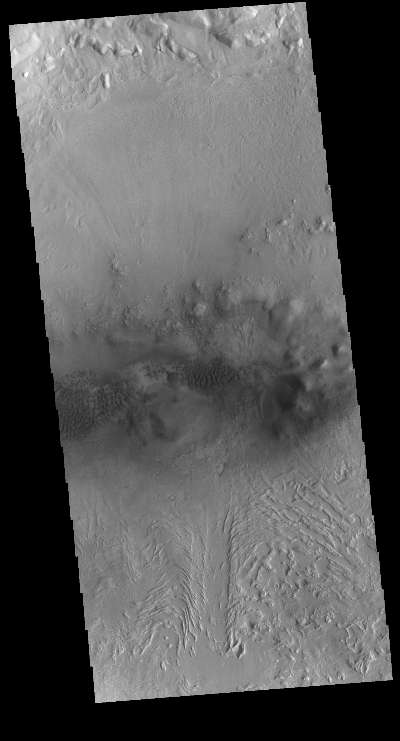 This VIS image is located on the floor of an unnamed crater between Terra Sabaea and Utopia Planitia. The center of the image contains several regions of sand dunes. The dunes occupy the lowest elevation of the crater. Towards the bottom of the image is an unusual texture, most likely created by movement of a volatile rich material down towards the center of the crater. This may have formed in a glacial type material, rich in ice.